It's always tempting to put off making a change for another day. But in today's always-on business environment, you need a financial system that's designed to work the way that you do. Don't wait for a crisis to make your move to a cloud financial system. The time to act is now. 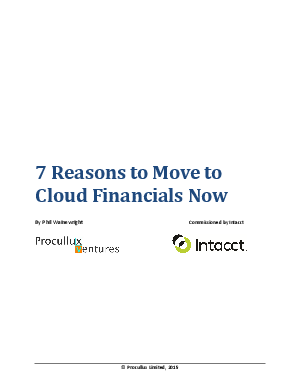 Download the white paper, 7 Reasons to Move to Cloud Financials Now, written by Phil Wainewright, renowned expert on cloud computing, to learn why you can't wait to make your move.